Japan plans to take 50% fewer bluefin tuna out of the Pacific Ocean next year. That’s a lot of tuna that will be left to breed, and Japan is hoping the move will help the population recover. 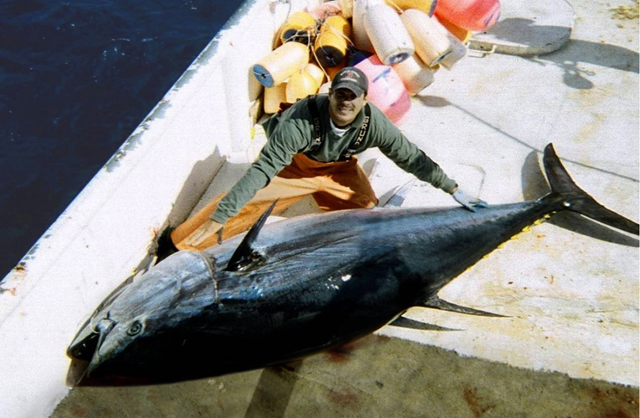 In January, an international scientific committee reported that Pacific Bluefin tuna populations had dropped by more than 96% over the decades that people have been keeping records. The report, issued by the Scientific Committee for Tuna and Tuna-like Species in the Northern Pacific says that almost all (90%)of the Pacific tuna caught are juveniles that haven’t had a chance to reproduce, which means the population isn’t able to replenish itself. If something doesn’t change, the Pacific Bluefin tuna will surely end up on the endangered species list with its Atlantic brethren. Since Japanese fisheries are responsible for 80% of the world’s tuna catch, this new move to reduce their haul should have a big impact on the numbers. Still, Japan is hoping to encourage other nations to follow suit, because they’re not the only country out there scooping tuna out of the sea. Management has to be a collaborative international effort. Bluefin have a range that spans the whole northern Pacific from East Asia to the west coast of the United States and from the gulf of Alaska all the way down to the coast of Mexico. As top predators, bluefin tuna influence the entire food web, and their depletion has a big impact on the ecosystem. Among the things that make them so vulnerable to over fishing is that they’re slow growing and late to mature. The science is still out on this, but experts suggest they live up to 26 years and don’t reach reproductive age until somewhere between three and seven years. Did you know? Because tuna swim in large schools, videos and still shots of them in the wild can be misleading. Shown in a large group with nothing but other tuna for reference, it’s hard to tell how large they are, but these guys can grow to ten feet long and weigh nearly 1,000 pounds.